DOVER – The results are in, and two artists – including a renowned name on both the national level and here in Delaware – have won top honors in the state’s Waterfowl and Trout Stamp art contests. 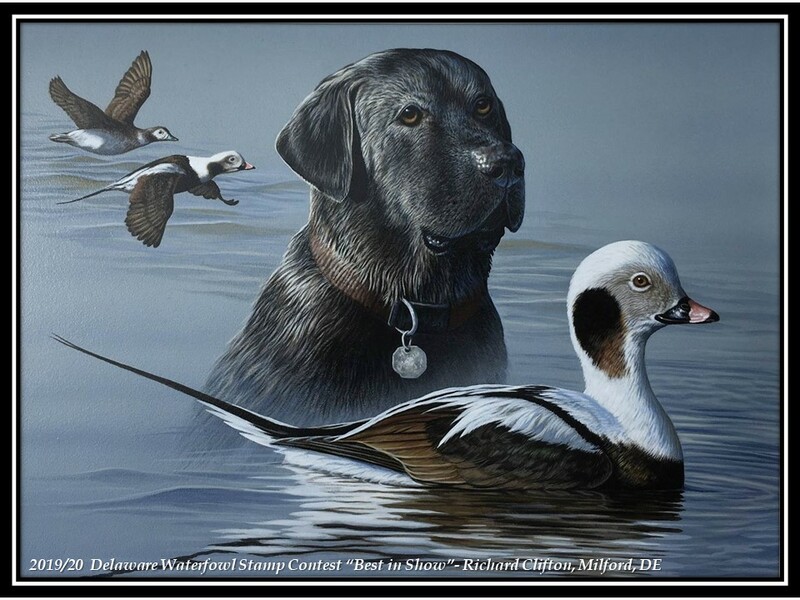 A painting of a long-tailed duck and a black Labrador retriever by Richard Clifton of Milford, Delaware, a past Federal duck stamp competition winner, who also has captured best in show in numerous state duck stamp contests, will grace the 2019/20 Delaware Waterfowl Stamp. A painting of a brook trout by Broderick Crawford of Clayton, Georgia, will adorn the 2019 Delaware Trout Stamp. Milford wildlife artist Richard Clifton with his best-of-show Waterfowl Stamp entry, which will be reproduced on the 2019/20 Delaware Waterfowl Stamp. Clifton and Crawford were chosen by contest judges in the DNREC Division of Fish & Wildlife’s annual stamp art competition, with the judging April 12 at the Dover Public Library. The stamp contests drew 30 entries for the 2019/20 Waterfowl Stamp and 16 entries for the 2019 Trout Stamp. 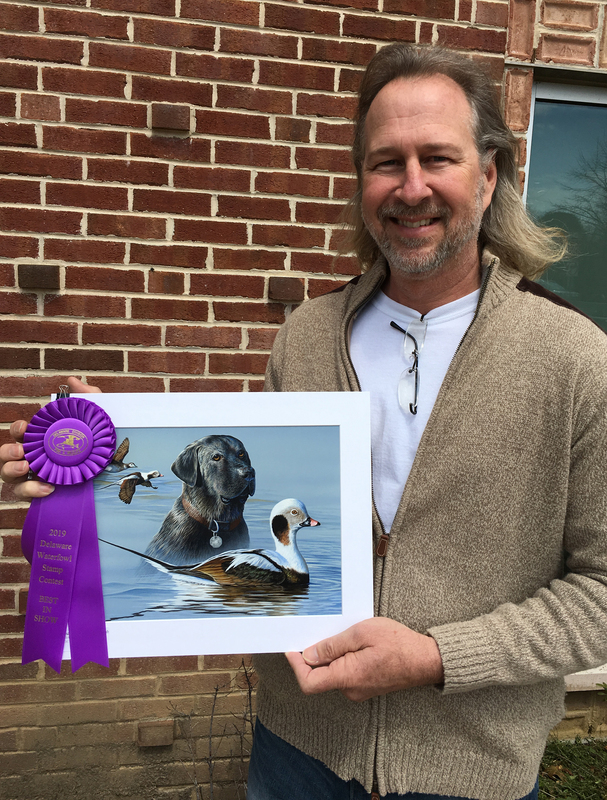 The 39th annual Waterfowl Stamp contest specified that submitted artwork must include a long-tailed duck and a black Labrador retriever. The trout stamp artwork can feature one or more species of brown, brook or rainbow trout in a setting or environment found in Delaware. As the 2019/20 Waterfowl Stamp winner, Richard Clifton receives a $2,500 prize and 150 artist’s proofs of the limited edition print series of his first-place entry. Clifton, who resides on a historic family farm near Prime Hook National Wildlife Refuge, is an avid hunter and self-taught wildlife artist who works in acrylics with waterfowl as one of his favorite subjects. He has painted 51 winning duck stamps, including eight Delaware Waterfowl Stamps, the 1996 Australian Duck Stamp and the 2007-2008 Federal Duck Stamp, and is the current Ducks Unlimited International Artist of the Year. As the 2019 Trout Stamp winner, Broderick Crawford receives $250 and retains the rights to reproduce and sell prints of the stamp. Broderick grew up in the southern Appalachians exploring streams and mountain sides all his life. He is an avid fly fisherman and supporter of Trout Unlimited. His favorite fish has always been the Brook Trout. A few years back he won the competition in Georgia with a Brook Trout for the Trout Unlimited vehicle tag in that state. Crawford is a wildlife and sporting art artist working in mostly acrylic paints who has entered and placed in Delaware’s stamp several times. Honorable mentions: Ryan Peterson, Jackson, Wyoming, rainbow trout; Stephen Hamrick, Lakeville, Minnisota, rainbow trout; and Jeffrey Klinefelter, Etna Green, Indiana, rainbow trout. The winning 2019/20 Delaware Waterfowl Stamp will be available July 1, 2019, and the winning 2019 Delaware Trout Stamp will be available Jan. 1, 2019. Waterfowl and Trout Stamp entries are on display Monday, April 16 through Friday, April 27 at the Bombay Hook National Wildlife Refuge Visitor Center, 2591 Whitehall Neck Road, Smyrna, DE 19977. Hours are 8 a.m. to 4 p.m. weekdays and 9 a.m. to 5 p.m. Saturdays and Sundays. For more information, please call 302-653-9345. The winning stamp art also can be viewed online. The winning waterfowl stamp entries and the winning trout stamp entries are posted on the DNREC web site. The 2019/20 Waterfowl Stamp judges were: Pete MacGaffin, Delaware Ducks Unlimited representative; Lloyd Alexander, art collector; F. Thomas Unruh, member of the Advisory Council on Wildlife and Freshwater Fish; Anthony Gonzon, wildlife biologist; and Justyn Foth, wildlife biologist. The 2019 Trout Stamp judges were: Desmond Kahn, White Clay Fly Fishers member; Cathy Martin, avid angler; Edna Stetzar, fisheries biologist; Scott Newlin, fisheries biologist; and F. Thomas Unruh member of the Advisory Council on Wildlife and Freshwater Fish. DNREC’s Division of Fish & Wildlife, in partnership with Ducks Unlimited, started the Delaware Waterfowl Stamp (formerly known as the Delaware Duck Stamp) and print program in 1980 to raise funds for waterfowl conservation, including acquiring and improving wetland habitats vital to the survival of migratory waterfowl. To date, more than $2.8 million has been raised. The Division of Fish & Wildlife began requiring trout stamps in the 1950s, and a trout stamp and a general fishing license are required to fish in designated trout waters during certain seasons. Trout stamp art was first used in 1977. The fees paid for Trout Stamps are used to purchase rainbow and brown trout from commercial hatcheries, with the purchased trout stocked in two downstate ponds and selected streams in northern New Castle County for Delaware’s trout seasons. Delaware hunting and fishing licenses, as well as Waterfowl Stamps and Trout Stamps, are sold online, at the licensing desk in DNREC’s Richardson & Robbins Building, 89 Kings Highway, Dover, DE 19901, and by license agents statewide. For additional information on Delaware hunting and fishing licenses, call 302-739-9918. For more information on Delaware’s waterfowl and trout stamp art competitions, please call DNREC’s Division of Fish & Wildlife at 302-739-9911.